Come indicato nel D.M. 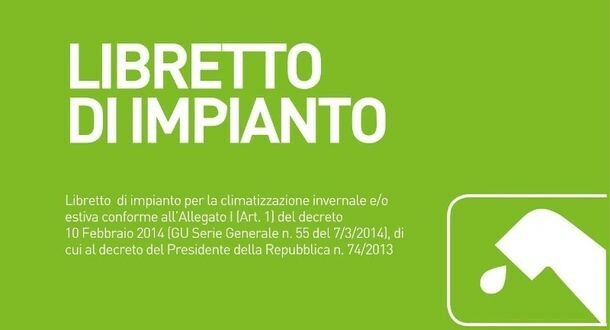 10 Febbraio 2014, questo decreto riguarda tutti gli impianti di climatizzazione invernale di potenza utile nominale maggiore di 10 kW e di climatizzazione estiva con potenza utile nominale maggiore di 12 kW. Nel nuovo libretto dovranno essere riportati tutti i componenti d’ impianto termico tra cui i sistemi di Contabilizzazione e Termoregolazione del calore. What i do not realize is actually how you are now not really much more neatly-preferred than you might be right now. You are very intelligent. You already know thus significantly with regards to this topic, produced me individually imagine it from numerous various angles. Its like women and men aren't fascinated except it is something to do with Woman gaga! Your own stuffs outstanding. Always deal with it up! Thanks for your marvelous posting! I really enjoyed reading it, you might be a great author.I will always bookmark your blog and definitely will come back in the foreseeable future. I want to encourage yourself to continue your great work, have a nice afternoon! I don't even know the way I ended up right here, however I thought this publish was great. I don't recognise who you're however certainly you're going to a well-known blogger in case you are not already. Cheers! Thanks to my father who informed me regarding this weblog, this website is genuinely amazing. What's up to all, since I am in fact eager of reading this weblog's post to be updated on a regular basis. It includes pleasant stuff. I'm not positive where you are getting your information, however great topic. I needs to spend some time learning more or figuring out more. Thanks for excellent info I was on the lookout for this information for my mission. Thanks for one's marvelous posting! I really enjoyed reading it, you may be a great author.I will make sure to bookmark your blog and will eventually come back very soon. I want to encourage that you continue your great writing, have a nice morning! Aw, this was an incredibly good post. Finding the time and actual effort to produce a superb article� but what can I say� I procrastinate a whole lot and never seem to get anything done. Great post. I was checking constantly this blog and I am inspired! Extremely helpful information specially the remaining phase :) I deal with such info a lot. I used to be looking for this particular information for a very long time. Thank you and good luck. Nice respond in return of this query with firm arguments and describing the whole thing about that. Hi! I could have sworn I've been to this blog before but after browsing through some of the post I realized it's new to me. Nonetheless, I'm definitely glad I found it and I'll be book-marking and checking back frequently! I used to be recommended this web site via my cousin. I am not certain whether or not this submit is written via him as nobody else know such special about my trouble. You're wonderful! Thanks! Wow that was odd. I just wrote an really long comment but after I clicked submit my comment didn't appear. Grrrr... well I'm not writing all that over again. Anyways, just wanted to say excellent blog! Wonderful goods from you, man. I've take into account your stuff prior to and you're just extremely excellent. I actually like what you've obtained here, certainly like what you're stating and the way in which by which you assert it. You make it entertaining and you continue to care for to stay it wise. I cant wait to learn much more from you. That is really a wonderful website. I am really enjoying the theme/design of your web site. Do you ever run into any web browser compatibility problems? A small number of my blog audience have complained about my blog not operating correctly in Explorer but looks great in Opera. Do you have any advice to help fix this issue? Truly no matter if someone doesn't understand after that its up to other people that they will help, so here it occurs. Hi, this weekend is pleasant designed for me, for the reason that this time i am reading this great educational paragraph here at my home. I like the valuable information you provide in your articles. I will bookmark your weblog and take a look at once more right here frequently. I'm reasonably sure I'll be informed a lot of new stuff right here! Good luck for the next! Simply want to say your article is as astounding. The clearness to your publish is just cool and i could think you're an expert in this subject. Well with your permission let me to grasp your feed to stay updated with forthcoming post. Thanks 1,000,000 and please continue the rewarding work. Hello! Someone in my Facebook group shared this website with us so I came to check it out. I'm definitely enjoying the information. I'm bookmarking and will be tweeting this to my followers! Wonderful blog and outstanding design and style. Excellent blog you have here but I was wanting to know if you knew of any message boards that cover the same topics talked about here? I'd really like to be a part of group where I can get feed-back from other experienced people that share the same interest. If you have any recommendations, please let me know. Appreciate it! Does your blog have a contact page? I'm having problems locating it but, I'd like to shoot you an email. I've got some recommendations for your blog you might be interested in hearing. Either way, great website and I look forward to seeing it expand over time. Hey there excellent website! Does running a blog such as this take a great deal of work? I've no understanding of coding but I was hoping to start my own blog in the near future. Anyway, if you have any suggestions or techniques for new blog owners please share. I understand this is off topic but I just wanted to ask. Appreciate it!